What started as a unexpected meeting between Brad Thorne, Director of Family Ministries at Wrightsdale Baptist Church in Peach Bottom, Pa., and Marla Stevick, Community Manager at HDC MidAtlantic’s Oak Bottom Village in Quarryville, turned into a week of community building and bonding full of surprises. Thorne visited Oak Bottom Village in the beginning of the summer to speak with Stevick and explain his role at the Church. 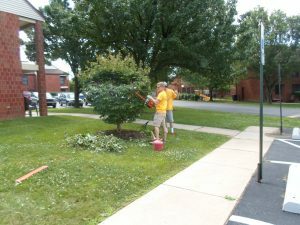 He told her about the Church’s yearly “Jesus Week” when members of the congregation go into nearby communities and assist with projects like landscaping, painting or construction. Stevick was surprised and grateful. She took Thorne on a tour of the apartment community to take stock of needs and priorities. Thorne noticed the playground had seen better days. He also noticed nearby basketball hoops could benefit from new backboards and poles. Thorne mentioned he had connections with several companies who might be willing to donate new equipment and he asked Stevick to come up with a “wish list” for Oak Bottom. As Thorne was getting ready to leave, he threw another surprise at Marla: Wrightsdale’s congregation was planning to volunteer their time for three days. Stevick, who was already excited and enthused about a new partnership with the Church, was completely floored by their generosity. Thorne explained that volunteers planned to work in the mornings then host activities for residents in the afternoons. The Church would provide all the supplies for projects and community activities, and in return asked that residents help complete projects. Stevick agreed to coordinating resident volunteers and the two planned to begin working on Wednesday, June 27 and finish on Friday, June 29. As the event approached, Thorne called Stevick to check in and share another surprise. 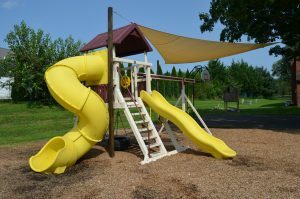 Swing Kingdom, a local playground equipment manufacturer, would donate a brand new playground to Oak Bottom. Marla could barely contain her excitement. A new playground would give the residents and their children a beautiful new place to play and spend time together. She couldn’t wait for the work week to begin, and neither could the residents. They were eager to volunteer alongside the congregation, which included almost 75 volunteers. Billy, a resident in his mid-twenties, who normally keeps to himself in his apartment, was outside bright and early with his tool belt stocked, waiting for the church volunteers arrive. 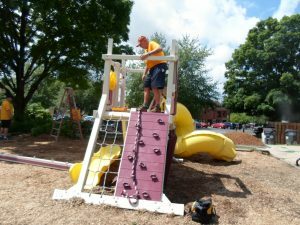 He enjoyed working on the playground installation, and the volunteer leaders almost had to pull him away from the site when stopped working for the day. While the older residents and volunteers worked on installing the new playground equipment, the younger volunteers washed windows and planted flowers. The group worked together so efficiently and harmoniously, they completed their planned projects early and were able to assist with even more maintenance, like building new benches for the playground and power washing the community’s dumpsters and surrounds. The residents and church volunteers celebrated their hard work and got to know each other more during the week’s afternoon activities. The church pulled out all the stops to thank and entertain the residents. 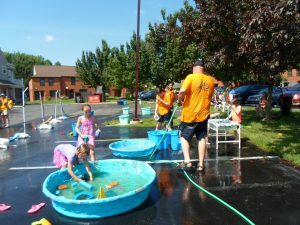 On Wednesday’s “Splash Day”, the church set up inflatable water toys working with the Quarryville Fire Department to supply the water so Oak Bottom wouldn’t have to. They celebrated Thursday’s work with a “Bounce Day”, bringing in inflatables for the residents to climb, bounce on and slide down. The week ended Friday afternoon with an authentic Lancaster County Chicken BBQ and a movie on an inflatable theater screen at the apartment community. While “Jesus Week” resulted in several improvements at Oak Bottom, it built more than just benches and basketball hoops…it built friendships between residents and volunteers, and an invaluable partnership between HDC MidAtlantic and Wrightsdale Baptist Church. The completed playground and basketball hoops installed by volunteers from Wrightsdale Baptist Church. HDC MidAtlantic would like to once again thank the congregation of Wrightsdale Baptist Church for their generosity and contributions to residents living at Oak Bottom Village. Interested in helping HDC MidAtlantic residents? Learn about volunteer opportunities and other ways to give here.